This guest post is by Hugh Mose, a transportation consultant who retired in 2014 after nearly 20 years as the General Manager of CATA, the transit provider in State College, PA (the home of Penn State). CATA transports nearly seven million passengers annually in a service area of less than 100,000 population. For further information, contact Hugh at hughamose@comcast.net or Eric Bernier, CATA’s Director of Information Services, at ebernier@catabus.com. 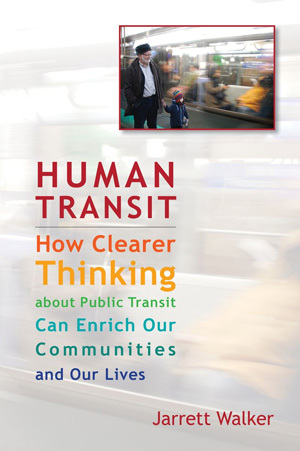 While transit oriented development is increasingly common in major urban areas, smaller communities are also working hard to ensure that public transportation can be a viable alternative to the single occupant vehicle. One good example is State College, Pennsylvania, where the Centre Area Transportation Authority (CATA) has been particularly successful in securing transit-supportive elements as part of new real estate developments. 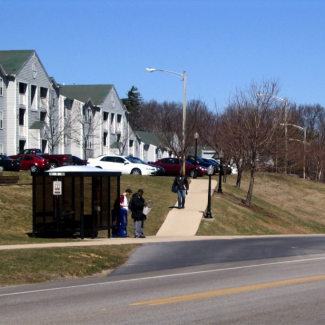 In State College and its surrounding municipalities, as in most small communities, there are no ordinances requiring new residential or commercial developments to incorporate any particular transit amenities. However, that hasn’t stopped CATA from working diligently for more than two decades to develop an informal support system, one which has produced uncommonly good results. The guiding philosophy at CATA is that the development getting built today is going to be there for 50 years. Lack of sidewalks, light-duty pavements, tight turning radii, and cul-de-sacs rather than through streets are going to be there forever, so nothing is more important than getting things right at the time the development is designed, approved and built. Build the relationships. Over the years CATA has built up a network of support within the development review process – consulting engineers, municipal staffs, planning commission members, local elected officials. And, CATA has established a very high level of credibility throughout the community. Then, commit the resources. CATA and the local planning agency share the cost of a transportation planner whose job it is to review and comment on development plans. Municipalities forward the plans; requests are made, meetings are held with the proponents, accommodations are negotiated. Lighted pathway from apartment buildings directly to bus stop/shelter/pull-off. 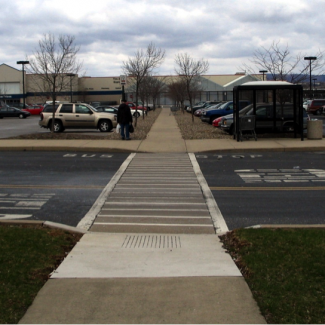 Pedestrian pathway from Wal-Mart store to bus stop, totally separated from parking. Bus pull-off and shelter constructed for CATA by shopping center developer. A pedestrian network. Nothing is more important than a complete system of direct, accessible and lighted pathways between project buildings, connecting with adjacent sites, and extending to the bus stop(s). After all, every bus rider is a pedestrian (or a bicyclist) before they board and after they alight! Location, location, location. The key elements that are considered include balancing passenger convenience with operating efficiency, avoiding conflicts with automobiles, integrating transit facilities into other planned amenities, and providing for safe and convenient street crossings. Developer investments. Developers understand that they need to invest in roadways, parking, streetlights, traffic mitigations, etc. 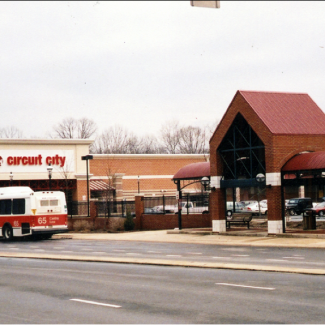 CATA asserts that transit amenities are no different. In addition, CATA offers to assume ongoing facility upkeep and maintenance – which removes a major objection. There’s a transit culture. Through successive projects, expectations have been established. The development community has come to understand that, even though there are no ordinances specifically requiring transit amenities, for project approvals to move expeditiously, transit has to be considered. CATA is reasonable it what it asks for. Because the program has no formal “teeth,” CATA is very willing to compromise, to consider and balance the limitation of the site, and to work with the developer to find a location for transit amenities that, while less than ideal, both parties can live with. These are the important takeaways: Be persistent; CATA’s present success is the result of more than twenty years of effort. Be prepared to work hard; the time and effort required is not insignificant. Be reasonable; after all, the program is built entirely on relationships and credibility. Build on past successes; nothing is more persuasive in current negotiations than showing what others have done before. Be resilient; accept that you can’t win them all. And, don’t get discouraged – success will come. 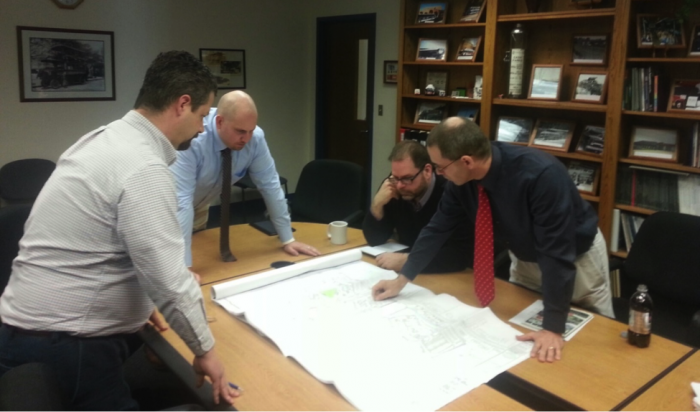 CATA and Centre Regional Planning Agency staff reviewing site plans. Are Parking Levies Better than (De)congestion Pricing?